I’m so sad to say one of our fab friends, FLAUNT PLUS SIZE BOUTIQUE is closing it’s doors March 31st. I did a Boutique of the Week Spotlight on Flaunt back in October. The store’s owner, Chelsey Lintini was very gracious and very passionate about giving PLUS-SIZE ladies a voice in Nashville. Let’s give her a great going away present by purchasing from the store this week. Even the couch is for sale! All sales final. Last day is March 31st! 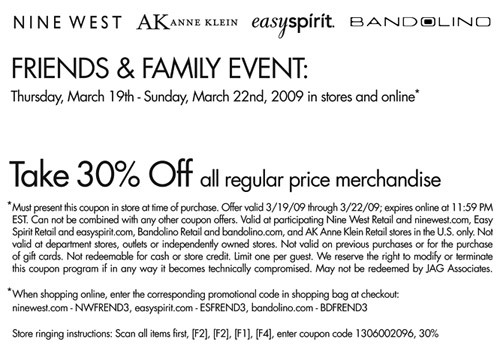 Nine West stores and affiliates are having a 30% friends and family event. This is a good time to get some deals on winter clearance items. Shop in the store @ the Green Hills Mall (in Nashville) and online.